This Solaire Infrared Gas Grill features commercial grade 304, 18 gauge stainless steel construction with heli-arc welded seams that are accented with hand-polished mirror finish. The hood is double skinned with a stay-cool, full width stainless steel knurled tubular handle. All Solaire Built-In Gas Grills are top-supported and self-trimming for easy installation. 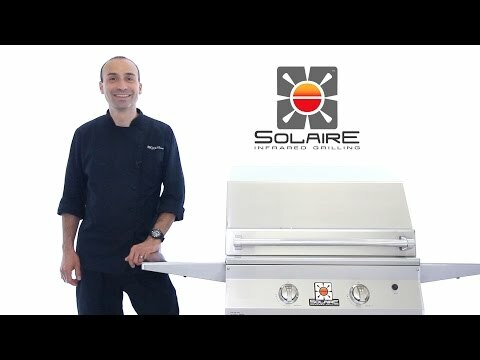 The Solaire 36 Inch Infrared Gas Grill comes with three Infrared burners at a total of 74,000 BTUs and has 560 square inches of effective grilling area making it a rocket under the hood. 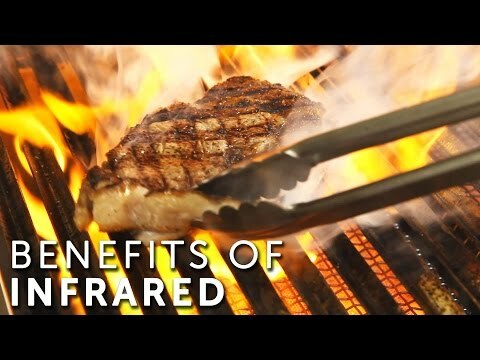 The Solaire Infrared burners preheat in 3 minutes and therefore it cooks food twice as fast and the intense direct heat, heats the food and does not rely on hot air circulation retaining more moisture and flavor than traditional gas grills. The stainless steel V-shaped grilling grates catch dripping to enhance flavor, but also reduce flare ups. The stainless steel warming rack is light enough for one-handed removal and the small manageable drip tray is removable for easy cleaning. The push button, rapid-start ignition make for easy start up. The Infrared burners are easily removable for cleaning or conversion to the optional conventional double-lanced ported stainless steel U-burners. The Solaire Gas Grills flexible burner design allows for easy conversion of any of their grills to all Infrared, InfraVection or all Convection giving their grills wider range of temperatures and making it the more versatile than many other brands on the market. This Deluxe model also includes a 16,000 BTU Rear Infrared Rotisserie Burner, motor, spit rod, forks and counter-weight. The Premium cart is made of the same commercial grade 304 stainless steel as the Solaire Gas Grills and features 2 drawers and a pull out tank or trash bin for convenient storage. The versatility of the Solaire Infrared Gas Grills allows you to grill anything from steaks, burgers, chicken, fish or even fruits and vegetables turning your backyard or patio into your favorite restaurant. 32 X 19" 32 1/4 X 20 1/4" 32 1/4 X 20 1/4" 30 X 22"